Tony Blair has challenged the “entrenched” attitudes of the Pope on homosexuality, and argued that it is time for him to “rethink” his views. Speaking to the gay magazine Attitude, the former Prime Minister, himself now a Roman Catholic, said that he wanted to urge religious figures everywhere to reinterpret their religious texts to see them as metaphorical, not literal, and suggested that in time this would make all religious groups accept gay people as equals. The Pope, who is 82, remains firmly opposed to any relaxation of the Church’s traditional stance on homosexuality, contraception or any other area of human sexuality. He has described homosexuality as a “tendency” towards an “intrinsic moral evil”. 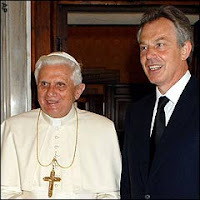 Mr Blair, who now travels the world on behalf of the Tony Blair Faith Foundation, which aims to promote understanding of the main religions, left the Church of England for Rome soon after leaving office in 2007.